Marketing a franchise online is an easy thing to do, but a difficult thing to do well. While most people know how to create a franchise site and even basic campaigns, it is very hard to actually create deals based on online tactics. It is not just about checking activity off of a to do list. At the end of the day, to be fair to all stakeholders, any marketing activity that requires budget, has to get results. The hard truth is… there is no universal formula to marketing franchises online. Each system has its own uniqueness and each franchisor has a different prospect with whom to follow up. One American VP of Franchise Development told me that his particular ratio is 1 deal to 200 leads, and this is not unusual for the industry. Frustrated with these odds, many systems give up, and go back to relying on brokers. Even though I love many in the broker community, their commissions are high, eating up profits and up to 75% of the initial franchise fees. Additionally franchisors across many sectors are saying the lead flow from them is slowing down. Over the years, I have seen many things change in the franchise world. In the early 2,000s, I had the honor of working with Greg Brophy, the founder of Shred-it. He grew his system to 250 units and over 1,000 trucks at its peak relying on Public Relations and positive word of mouth. I remember helping him design the famous Shred-it truck, on a shivering cold Toronto morning. Greg seemed immune to the elements with his optimistic demeanor and get-it-done work ethic while my hands were getting so numb I could no longer take notes! Even after his tragic death in 2007, the system is still going strong. Later, I was able to work within an education franchise growing from an emerging franchise to one where the team was closing 5 deals/month from online sources for a total of over 400 units in the US, Canada, UK and beyond. It has been exciting to work with franchise systems over the years in a digital capacity, and from that I know what is possible. A good salesperson will recognize intuitively when they are talking to the right kind of person. However, when it comes to Marketing, you have to program a system; today prospects are already 70% through the funnel before they even talk to someone. In a nutshell, in order to truly reach your ideal buyer, you need to “cut through the clutter”. Previously, advertisers were limited by space. Today, they are limited by attention. In order to get someone’s attention, you need to resonate with them clearly, and that is done through creating a message that really speaks to them and where they are. You need to craftily answer “so what who cares” in a convincing way. For example, a persona for many franchisors is “career changer” since for those at a certain price-point, the trigger for someone buying a business is discontent with their current job. If you are targeting career changers, you can do that through messaging around current franchisees who have successfully made the change, or by targeting certain career types online. Once you have the right personas, the tactics for them start to flow like common sense. Purchasing space on an e-mail list belonging to a website, media outlet or association can be an effective if underestimated tactic in Franchise Development. This is very different from buying a list of people who did not opt in, which is against many privacy laws. The tactic I am talking about is the website, media outlet or association e-mailing their list, your message. E-mail lists of Franchise Portals can work well for many systems. If you get a bit more creative, you can also think beyond the direct franchise space such as ones that target veterans or others within your persona set. Since the ratio of leads to deals is typically low in franchising, it is important to be able to track leads that turn into deals back to their lead source. This way you can find out what leads are converting, and what leads are creating activity, but no deals. Certain CRMs such as Hubspot or Pardot can do this. WordPress also has some free plugins that accomplish the same thing. Public Relations is a powerful tool for both franchisors and franchisees. Talk to any founder, and you will hear some incredible stories about how the foundations of the brand were built which sounds more like an episode of “Survivor” instead of “The Apprentice”! Franchisees can also have some incredible stories. Whether it is a rags to riches, a mom in business or even someone who portrays their journey from a desk job to their own business, it can be quite interesting. These stories can galvanize onlookers into action! Your story isn’t just what you tell people it’s also what they believe about you based on the signals your brand sends. The story is a complete picture made up of facts, feelings and interpretations, which means that part of your story isn’t even told by you. Public relations also has a 1-2 punch. There are the initial leads that you get from the original story, then you can distribute the story to your own network, using it for sales people to revive conversations or of course creating a Social Media campaign around them. A key part of your franchise marketing strategy is downloadable content. Gated content, that creates a lot of value is key to getting your prospect’s contact information, and beginning a digital relationship with them. I have seen gated content creating up to a 5% conversion rate on a website. Downloadable content great for franchise buyers includes industry reports with the top content as industry growth, but trends and performance reports can also add a lot of value. Following up to the downloadable content, a lead nurturing sequence helps keep the relationship alive with contacts. More and more, we are used to having a digital relationship with people. In fact, according to Business Insider, Apple confirmed that the average person unlocks their phone 80 times/day! If you have different prospect types, such as a career changer vs. a military veteran for example, there are likely different things about your franchise value proposition that they will be drawn to. The career changer who has a background in sales for example, may enjoy the recognition that they receive in the system, while having more autonomy and freedom. Whereas the veteran may enjoy having a defined and successful system to follow. 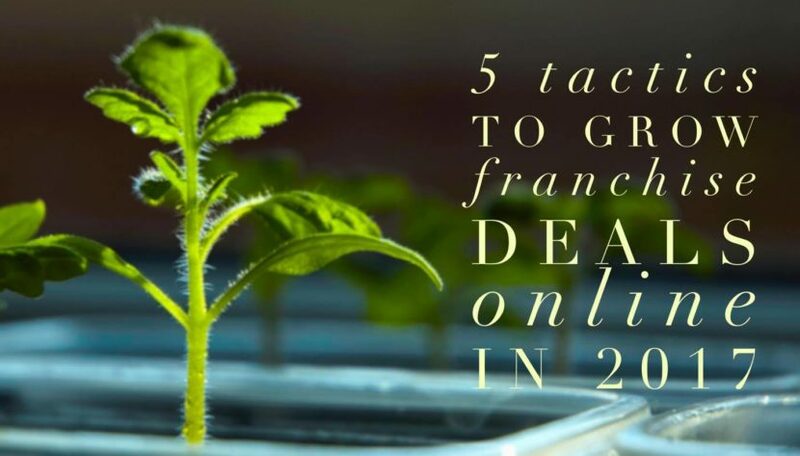 While there are a lot of people who talk about how to grow visits or even leads for a franchise system, very few people know how to grow deals successfully. That is why all of the tips above are ones I have seen work myself, or have worked with my friends or colleagues. As a follow-up to this article, I am going to do a post about what tactics do not work in Franchise Development. If you would liked this article, you may want to try reading my 50 Lead Gen Ideas to Start in 2017 download!